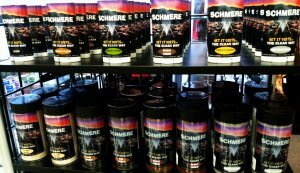 Responding to numerous customer requests, Thomas FX has brought in a shipment of various Schmere dirt and aging products. Now, film, television, and theater professionals can effectively age and distress wardrobe items quickly. With the addition of the Schmere line of products, Thomas FX now provides a wide and diverse line of aging products for use on actors, and on their wardrobe items. Stay tuned as we introduce other new entertaining products.